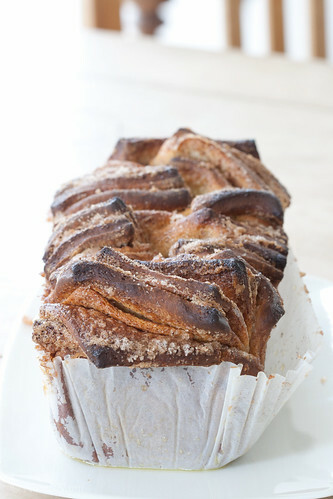 Is there a self-respecting food blogger out there who has not yet tried Joy the Baker's fabulous cinnamon sugar pull-apart bread? Not here in Estonia, I suspect - this cinnamon bread has popped up on pretty much every Estonian blog on my reading list :) I've made it thrice myself, and love it. I've used three different dough recipes - my cinnamon roll recipe, my korvapuusti dough recipe and finally slightly adapted version of Joy's recipe. The last one was the winner for this particular one :) I've simplified the process considerably, however. I'm quite experienced in making and comfortable with using sweet yeast dough and I would say the complicated dough-making process involving several steps described by Joy isn't simply justified. It's a simple pastry, the fabulousness of it is in the way it's shaped, and not in the way the dough is made. Special thanks to Jaanika (blogging @ Maitse asi) who came up with an excellent Estonian name for this type of bread! It's best on the day it's made (and probably won't last much longer anyway), but you can wrap it in a clingfilm and keep it for up to two days at the room temperature. * Note that I've used instant yeast that can be simply mixed with dry ingredients. If you're using active dry yeast, you need to activate and proof it first. In your mixing bowl, combine flour, sugar, instant yeast and salt. Break the eggs into a small bowl. Heat the butter and milk in a small saucepan until the butter has melted. Cool a little, then whisk in the eggs. Pour into the dry ingredients and stir and knean, until combined and the dough breaks loose from the sides of the bowl. (If it's too dry, add a spoonful of milk; if too sticky, add a spoonful of flour). Cover the dough with a clean kitchen towel and leave to rise until doubled in side in a warm draught-free room. (Or, if you prefer, let rise for about an hour at the room temperature, then transfer into your fridge overnight. 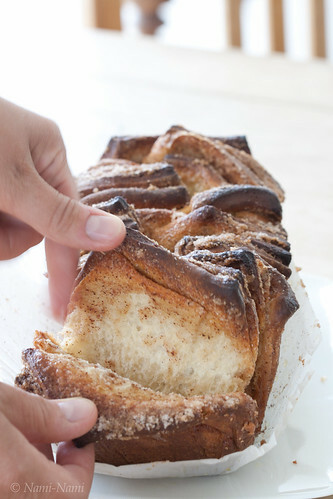 Then you can quickly and easily bake warm cinnamon sugar pull-apart bread for breakfast). Mix the sugar, cinnamon and nutmeg for the filling in a small bowl. Melt the butter (you can brown it a little, if you prefer the flavour). Take a loaf tin (mine was 22x12x7 cm), butter it generously or line with a parchment paper. On a lightly floured surface, roll the yeast dough into a rectangle about 30x50 cm. 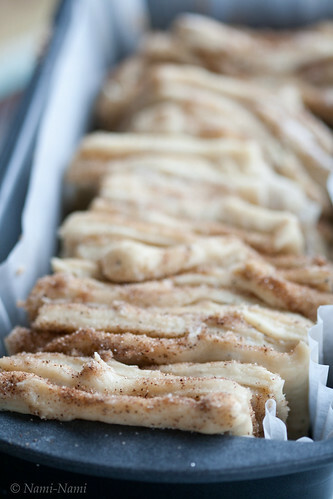 Brush the surface with melted butter and sprinkle the cinnamon sugar evenly on top. Cut vertically into six even strips. Gently lift them on top of each other, then cut into six square towers again. Place these, side down, into the loaf tin. Cover with a kitchen towel and leave to rise for 30-45 minutes. Bake in a preheated 200 C/400 F oven for 30-35 minutes, until dark golden brown on top (just golden brown isn't enough - the bread will be still slightly under-baked inside then). Turns out I'm not very self-respecting, then, because I haven't made this! I'm off to check my pantry for cinnamon! Looks lovely!